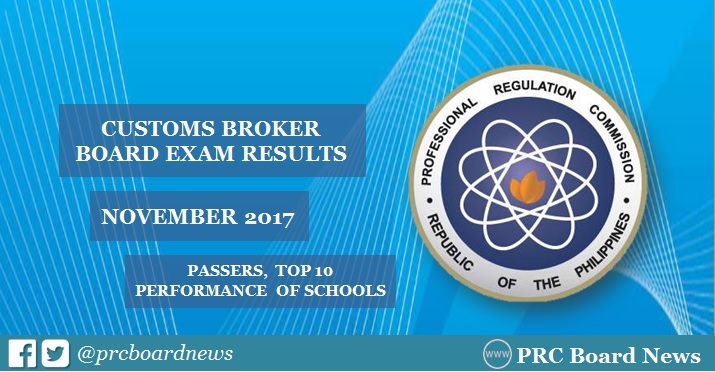 MANILA, Philippines – The Professional Regulation Commission (PRC) and the Board for Customs Brokers released results of November 2017 Customs Broker board exam expected on Tuesday, November 28, 2017 or in three (3) working days after the last day of examinations. The official list of passers, top 10 (topnotchers), top performing schools and performance of schools are available on this page as announced online. As announced, 1,114 out of 2,093 passed the exams. PRC administered the Customs Broker board exam on November 22 and 23, in the cities of Manila, Cagayan de Oro, Cebu and Davao. The two-day exam covered the following subjects: customs law, rules, ethics and customs broker practices, customs documentation, clearance and procedures, tariff law, rules and regulations and internal trade, classification and practical computations. In the November 2016 exam, results were released online after two (2) working days. A total of 1,030 out of 2,022 passed the tests. Gordon College Olongapo City topped the schools with 88.71% passing rate or 55 out of 62 passed. In the November 2015 exams, results were announced in three (3) working days. PRC named 721 out of 1,764 who have passed the exams. Gordon College also led the schools, 80.00 % or 24 out of 30 successfully hurdled the tests.